A few months ago I naively posted the plans for our kitchen remodel cost on a budget. I touted that we were going to complete our remodel on a budget of $13,000 (with a $2,000 contingency). It was going to be such a smooth project. While most of my articles are either about my family’s journey to a better financial life or financial advice for young families, this post is neither. It’s about us spending a lot of money on a kitchen remodel. Shame on this personal finance blogger! The good news is we did not go back into debt to pay for the remodel despite the cost. On the negative side, we had to dip into our 6 month emergency fund as a result of going over budget. As of right now, we only have about 2 months worth of expenses in our emergency fund so our top priority in 2019 will be building it back up. For the last seven years we’ve been aggressively paying down debt. 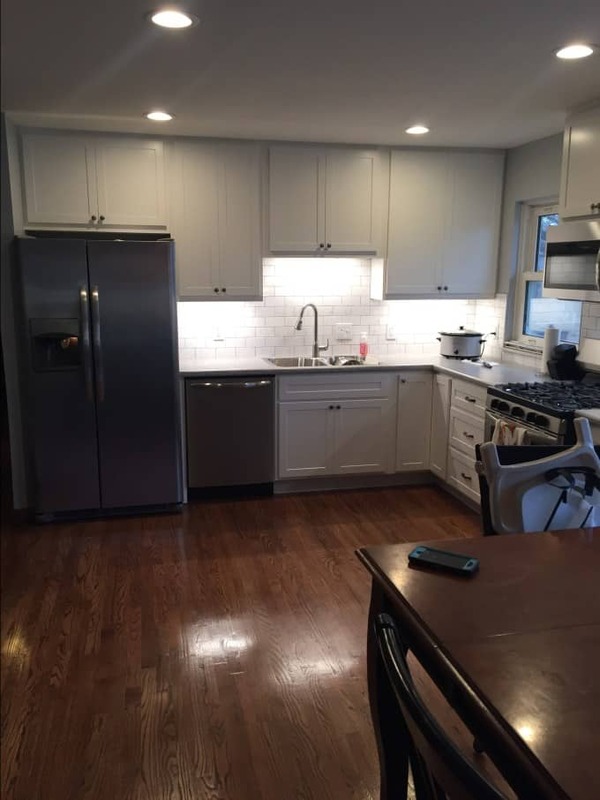 Along the way we’ve been far from perfect, and this kitchen remodel was a way of rewarding ourselves for becoming completely debt free. I also have to continue to remind myself that if we ever decide to move, which is a possibility over the next few years, we should be able to recoup most of the cost from the kitchen remodel. We moved into our home in late 2008. It’s a 1,500 square foot, three bedroom, two and a half bath, all brick ranch with a basement. The home was built in 1968 (happy 50th birthday!) and is structurally in good shape. It’s in a middle class neighborhood and within walking distance to our 4-year-old’s preschool, a recently remodeled library, and a few other stores and restaurants. The house needed a full remodel upon moving in. The living room still had the original avocado colored carpeting, bathrooms were littered with 1×1 tile on the walls and floor, and the walls were covered in wallpaper. Before we moved in to the house in 2008, my wife (girlfriend at the time) and I spent months removing wallpaper, adding a skim coat to the walls, and repainting. We also ripped up the carpet from the living room and refinished the underlying hardwood floors. Within the first few years of moving in, we also had to replace the roof, HVAC, and recently the water heater. These large expenditures delayed several of our home remodel projects. Regardless, over the past 10 years we have mostly updated the rest of the house. We’ve gutted and completely remodeled two bathrooms, refinished the flooring in the bedrooms, and upgraded the basement. When we decided to go all in to pay off our mortgage in 2016, we also made a decision to put all renovations on hold. Our kitchen had the original cabinets and countertops, and three layers of laminate flooring needed to come up. We lived with an ugly kitchen for a long time. However, living with an ugly kitchen is one of the sacrifices we made to become debt free. Going through a kitchen remodel was a new experience. According to home advisor.com, the national average for a kitchen remodel is nearly $23,000. Our original goal was to complete the remodel with $13,000 with an additional $2,000 as contingency for the unknowns that may have come up along the way. It turns out we ended up spending more than the national average and nearly double our budget. We exceeded our budget primarily for two reasons. Scope Creep: We originally planned to complete the demolition work ourselves to save some money. While having the contractor complete the demo work added an additional $3,000 to our budget, I’m glad we spent the money as it would have taken me weeks to gut our old kitchen. The three layers of flooring took two professionals nearly three days to complete. One of the layers had staples every few inches which would have been a nightmare. Additionally, we also decided to remove the soffit above our old cabinets, paint the hallway, and add additional lighting. Underestimating the Cost of Contractors: We had one or two people working on our kitchen almost daily for six weeks. While I knew that a kitchen remodel would be a big job, I didn’t expect to be without a kitchen for six weeks. It was a huge effort and I wanted to ensure we had an experienced contractor to complete the work. If you weren’t aware, quality contractors are expensive! Failing to Budget for Several Expenses: As you’ll read below, due to my lack of experience there were several significant costs that I failed to budget for. These include drywall, electric, contractor overhead, and plumbing. It seems so obvious now that these needed to be included but at the time I was more focused on the cosmetic updates such as cabinets, countertops, and flooring. When we started planning for our kitchen remodel, we realized that we didn’t even know where to begin. For example, does the flooring go in before or after the cabinets and countertops? What surprises were we going to encounter when opening the walls? Below is the high level breakdown of the work completed each week. Our first big purchase was the cabinets and countertops. We purchased white stock cabinets and a formica laminate countertop from Hoods, which is a discount home center that sells quality home goods at low prices. One mistake we made here was not getting a detailed layout. While they did provide us a visual of the kitchen it was nearly impossible to see the smaller details such as filler pieces. This resulted in rework for the contractors and ended up eating into any cost savings for purchasing the materials separately. At first I also regretted not going with higher end countertops such as granite. However, now that they are installed the countertops look really good. You can barely tell that they are a lower cost option. We’ll see how well they hold up over the years. We did not include any dollars for demolition in our original budget. While it was not cheap to have the contractors complete the demo, to me it was well worth the cost as it would have taken me weeks to complete the work. Going six weeks without a kitchen was long enough. The demo included removing all cabinets, countertops, flooring in the kitchen and hallway, soffit, and drywall behind the original cabinets. We decided to go with hardwood flooring, which has made the entire first level of our home hardwood. While we purchased generic stock hardwood flooring, after installation the contractor had to sand and stain the flooring to match it to the rest of the house. They did an amazing job matching brand new hardwood to our 50-year-old hardwood flooring that had been refinished years ago. You can barely tell a difference where the transitions occur. In addition, we also replaced the laminate flooring in the hallways. There was about 500 square feet of flooring replaced total. Since the hallways all lead to our bedrooms, we had to move out of our house during week 3 so the flooring work could be completed. Thankfully, my parents live close and have extra bedrooms for our family of four. We also originally purchased our backsplash from Hoods. It turned out that the backsplash we originally bought was “peel and stick” which our contractor wouldn’t work with. Another fail on my part for not realizing what we had purchased. We originally spent nearly $400 on the materials for the backsplash. The original tile was returned and we purchased ceramic tile from a different store at half the price. Not sure what the original would have looked like, but the ceramic tile looks amazing! Despite not making significant changes to the floorplan, we wanted to add additional lighting. We installed four canned lights, along with lighting under the cabinets and over the sink. Wow, what a difference this has made. I’m not sure we fully realized how dark it was in our kitchen before. Our appliance purchases included a stainless steel refrigerator, stove, and overhead microwave. The dishwasher was the one thing that survived the old kitchen since it was recently purchased with the remodel in mind. 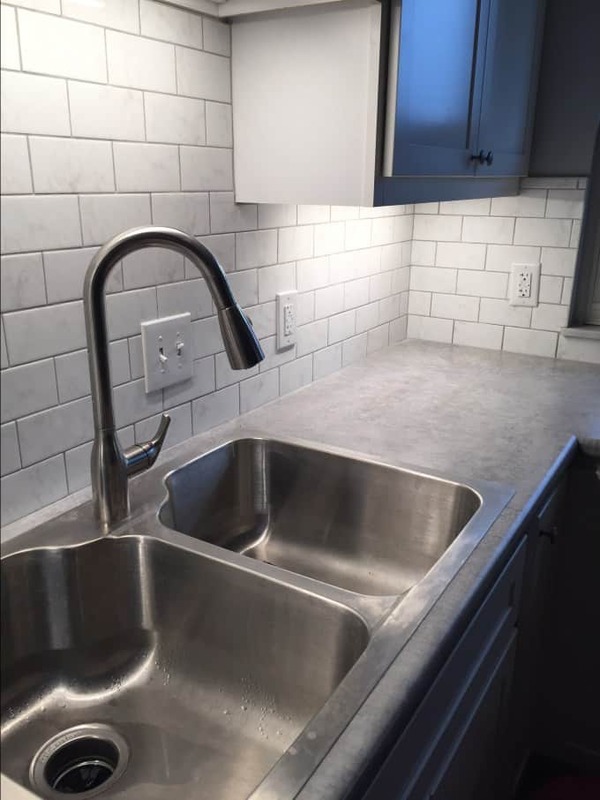 We also included the sink and garbage disposal in this category. We ended up purchasing our appliances at Lowe’s. They had a good deal on the appliances and we also received a small rebate. This is the one category I felt that we really overspent. Part of the reason is because I’m a decent painter and I could do nearly as good a job as the contractor. The paining included the kitchen and hallway, both walls and ceiling. I had originally planned to paint the hallway myself. However, I started having flashbacks to when I originally painted that hallway years ago. There are five doors in the hallway which means a lot of edging and tight corners. So, we caved and asked the contractor to paint the hallway as well. This is another area where we failed to budget much of anything up front. This effort required more electrical work than expected. We went from having one outlet above our countertops to five. The under cabinet lighting also required a bit of electrical work. As a result, the electrical box had to be rewired to include or replace several breakers. This was no small effort and was complicated by poor electrical work that had been done years ago. Thankfully there were no huge surprises with plumbing. The plumbing basically included the work under the sink including installing the garbage disposal. This was another expense we foolishly didn’t account for in our original estimate. All of the drywall was removed, plus the soffit above the original cabinets. This allowed us to install 42 inch cabinets instead of the 30 inch cabinets we had there before. What a difference the additional 12 inches makes! All of the trim for the baseboards and doors needed to be removed and reinstalled as well. Thankfully, we still had a few pieces of baseboard from when it was installed throughout our house a few years ago. Since we used a general contractor for the remodel, there were additional costs for overhead not originally expected. As I’ve mentioned a few times, the contractors did really good work on the kitchen. Much better than I could have even come close to. Plus, if I attempted to complete this remodel myself with the help of friends and family, it would have taken months. With two small children at home that would have been really tough. Our general contractor also communicated really well, which I appreciated. Really, the only downside to our general contractor was that he was a bit dramatic when things didn’t go as planned. Instead, I was often the one coming up with potential solutions to problems. He had a lot of experience but frequently came across things he had “never seen” before. All in all it was a good experience. I would use them again for another large project. In fact, if we eventually get involved in rental properties we will consider them for any work. To summarize, below is the final cost of our kitchen remodel. For someone who has been relatively frugal for so long, that is a painful number to write out. The silver lining is that the remodel should increase the value of our home. We’ve had a decent amount of turnover in our neighborhood over the last few years and the updated homes have gone for about $30,000 more than ones that need work. We just have a few projects left before our house is mostly updated, with the biggest being finishing our basement bathroom. We learned a lot through this experience. It certainly cost more than we expected and being without a kitchen with a family of four for six weeks was a pain. Below are a few of our lessons learned. Include your contractor in the discussion when purchasing materials. We ended up purchasing cabinets, countertops, and backsplash before we reached out to any contractors. In hindsight, we should have found our contractor first and then decided where to purchase these materials. We thought we were saving money by purchasing from a discount retailer, but in the end it cost us more due to the rework required due to a lack of detailed designs. 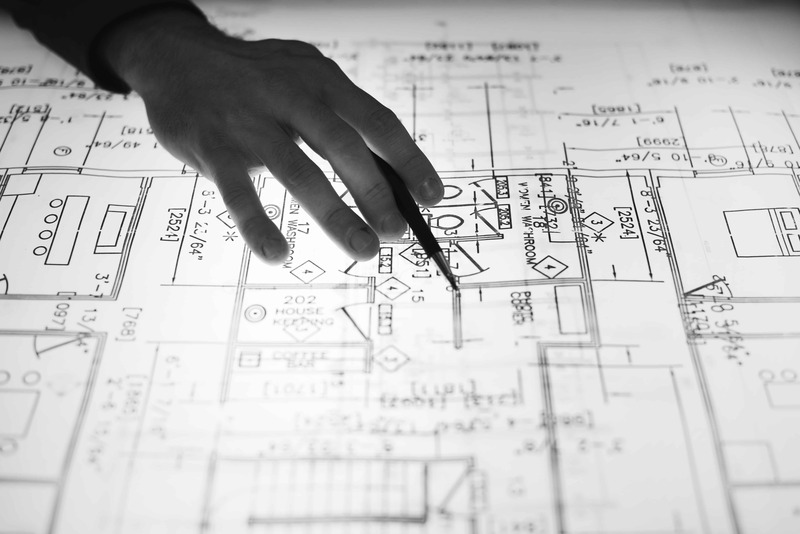 If you do end up purchasing materials separately, ensure you get detailed floor plans. Always expect surprises, especially when opening up walls. For a couple weeks it seemed like we had surprises at almost every turn. Opening the walls exposed us to electrical issues and termite damage that we weren’t aware of. Don’t expect your general contractor to have all the answers. Even though paying a general contractor isn’t cheap, you have to be involved in the process and bring an outside perspective when challenges come up. This is especially true when you purchase materials on your own. Be sure to include electric, plumbing, drywall, and other miscellaneous expenses in your budget. There were several items that I didn’t even think to include in our original budget. A full kitchen remodel is a huge effort and requires more than just installing materials. There is a lot of behind-the-scenes work that has to take place. Be sure you have a makeshift kitchen. During our remodel we definitely ate out more than usual. Thankfully we did have a makeshift kitchen in our basement with a hot plate, microwave, and toaster oven. It wasn’t the same but it kept us from eating out even more often. We competed the remodel in time to have a Christmas party at our house the Sunday before Christmas. Our backsplash was literally installed the day before on Saturday and I was screwing in outlet covers on Sunday morning. We cut it about as close as it could get but it ended up working out. Below are photos of our completed kitchen. The before photo above included the original cabinets and countertops from when the house was built 50 years ago. We lived with that ugly kitchen for 10 years. While I usually don’t care what others think, I’ll admit that it was kind of embarrassing to have people over with that kitchen. We are very happy with how everything turned out. Let me know what you think! when we bought our house we had similar work to do and a number of rooms required “remodelling” as you call it – some of it was essential/urgent and some of it was optional or something we could put on the later-base. I think that these costs are ignored when people think of the cost of housing – it takes up a lot of time, money and gives you not only bills but many sleepless nights and stress when dealing with tradespeople/contractors. I think that we saved over £1000/$1500 doing this. Thanks for sharing your tip. We did see a few designs with shelving instead of cupboards. Our cupboards weren’t too expensive, but I’m sure we still could have saved. We have spent so much money on the house we’re in now. Almost everything has been updated and it hasn’t been cheap. It’s close to being completely updated now after 10 years, but there’s still work to do! I’m about to buy a fixer upper so this post came at a great time! Very useful, thank you! Awesome! Good luck on the purchase! The kitchen looks nice, and I had to re-read your article again to check what type of countertop material you used. That’s a nice looking formica. I thought it was stainless at first look. Not sure how bright your kitchen is now but I’d probably put more of those recessed lights. Yeah, the countertops look pretty good. You should have seen the lighting in our kitchen before. No undercabinet lights and one dim light in the kitchen area. With four canned lights and under cabinet lighting it is super bright now! Thanks for commenting! Your new kitchen is so beautiful! It would be nice to see the before & after pictures closer together for a more dramatic effect. I’m sure this post will be very helpful for anyone planning a remodel. They always cost more than planned! Thank you! And thanks for he suggestion. I may add a few more pictures and put them side by side. The remodel was definitely a learning experience!